The Tad James Company offers the most advanced Hypnosis courses available today. NLP and Time Line Therapy® are both advanced hypnosis training techniques for assisting people to change quickly, without a formal induction. All of our Hypnosis trainings includes the work of Dr. Tad James, MS, PhD, an acknowledged expert in Hypnosis and the author of Hypnosis: A Comprehensive Guide and Dr. Adriana James, MA, PhD, demonstrating their advanced techniques to take you beyond anything you already know. There are two different trainings to choose from: the Hypnosis Trainers Training and the Hypnotherapy Certification Weekend – both courses offer the very best in training from some of the world’s best NLP and Hypnosis trainers. Most schools of thought regarding the mind agree that we all have a Conscious Mind and an Unconscious Mind. Changing anyone’s attitudes, beliefs and values is not easy because most people, approach this change consciously. Change actually needs a two-pronged approach that takes both the Conscious Mind and the Unconscious Mind into account. Hypnosis facilitates change by making the Unconscious Mind more amenable to suggestion from the Hypnotist or even from your Conscious mind. Your Unconscious Mind is the part of you that runs your body. It allows you to breathe while you sleep. It makes your heart beat. Your unconscious mind causes your nerves to send information along the neural pathways. The Unconscious Mind is the source of the intelligence of your body. Hypnosis and Hypnotherapy allow you to tap into the power of the Unconscious Mind to change your life for the better. Hypnosis is a credible, scientifically-based process for successfully creating change at the unconscious level and this is what we teach you to do. Why Do We Want To Learn Hypnosis? On one hand, we are learning how to be superb Hypnotherapists, able to lead others to the rich benefits of trance. On the other hand, we are learning how to be very good hypnotic subjects, so that we can access those benefits by entering trance ourselves. In the book Hypnosis: a Comprehensive Guide, it states, “The value of experiencing trance and learning hypnosis lies in attaining power to heal our own bodies and guide clients in healing theirs’ . . . power to learn . . . and power to create changes in our lives.” NLP, Time Line Therapy® and Hypnosis are all about creating change — that is, making your life better. Hypnosis offers you an opportunity to tap into real power and create lasting change in your life. You can heal what needs to be healed, preserve learning experiences from the past, and make new neurological connections to manifest your dreams. For these purposes, we teach NLP, Time Line Therapy® and Hypnosis to hundreds of people each year. Our Unconscious minds have all the resources we need to create the future of our dreams and control our own destinies. Like Neuro Linguistic Programming and Time Line Therapy®, Hypnosis is about self mastery and becoming the person you have always wanted to be. You are invited to learn the latest hypnosis techniques and receive your Certificate in Hypnosis by completing the FasTrak Weekend Course being offered in your area by The Tad James Co.
Hypnosis is a scientifically verified and effective technique that can promote accelerated human change. The FasTrak Weekend programs will teach you how to stimulate desired changes in behaviour and encourage mental and physical well-being. During this weekend you will learn how to guide yourself and others to lose weight, quit smoking, control pain, reduce stress and enhance performance. These programs are especially suited for health care professionals, practicing therapists, and individuals seeking to make a positive change in their lives. The FasTrak Hypnosis Course will teach you how to use hypnosis to stimulate desired changes in motivational behaviour. Through a series of fascinating discussions, informative demonstrations, and interactive exercises, you will be using hypnosis after only one weekend. And at the end of the weekend, you’ll have your manual and an open book test to complete at home. Once you’ve completed the open book test, you’ll be on your way to see clients straight away. And remember you’ll have the Tad James Company’s full support for life, whenever you need it. 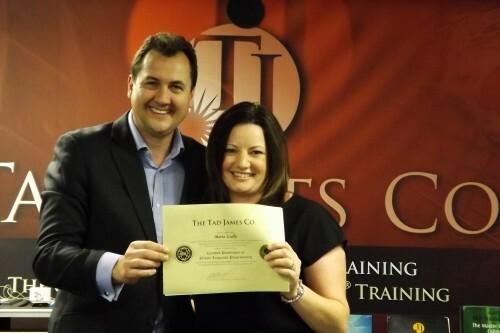 The Tad James Co. is an internationally recognised leader in hypnosis probably offering the broadest hypnosis instruction program available anywhere. Both beginners and professionals benefit from the hands-on training offered in the FasTrak Certification Course. He is currently the Director of Training and Research for Tad James Co., the largest NLP and Hypnotherapy training institute in the world – and co-founder of the Time Line Therapy® Association. As you will experience, all Tad James Company faculty are certified trainers in hypnosis, NLP,Time Line Therapy® and NLP coaching. Over the last 27 years they have taught thousands of students to become fully qualified hypnotists by using a unique yet easy to understand process that builds on positive results. You will find this course quite different from traditional programs as it provides intense hands-on training. There are no long case history videos to watch. Instead, you will participate fully in this learning experience with each step explained and demonstrated before you are then given the opportunity to learn by doing. There’s something for everyone in this course. Beginning therapists will receive a solid foundation for using hypnosis. Veteran practitioners are sure to learn some surprising new approaches to hypnosis. Healthcare professionals will discover a new way to enhance their practice. And, if you are a person who is just ‘interested’ in hypnosis, you will learn how to convert positive thoughts into positive changes in your life. The Tad James Co. faculty and staff are as close as the telephone, ready to answer your questions and support needs. Since 1982, no group has taught more students or created a wider network of support than our faculty and staff. At the end of the training you will receive a personal completion certificate from the Tad James Co., which you will need for certification. This course also qualifies graduates for certification and registration by the American Board of Hypnotherapy (this is an international certification and a fee is applicable). This program is only one of the many courses we offer which feature different applications for hypnosis skills, different types of hypnosis, and related fields such as NLP. We believe that student satisfaction is vital. If at any time prior to the end of the training you should become dissatisfied with the program, simply inform the instructor and we will refund your entire enrolment fee. We provide lifetime support with any purchase of product and on any training you take with us. If at any time before, during or after your course, you have a question or need some help, we’ll be there for you. To get you started straight away, we’ll send you your Hypnosis Introductory Kit as soon as you sign up. You’re sure to find it stimulating and enlightening, and you’ll begin to see just how the excellence of our seminars and courses has made us the leading NLP training company in the world. So choose to take your life to the next level today, and experience this seminar with an established world leader. Early Bird Seats and group rates are available, please contact our office for eligibility.